Looking for marketing video software? Animiz is designed to help you create amazing video contents to boost your marketing campaign. What you will love about Animiz is its sectioned library of roles. You have an easy access to more than 40 different animated characters in the library of roles. 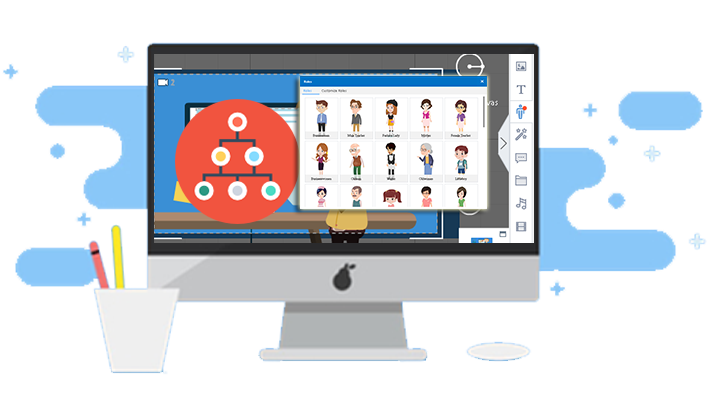 According to the function the characters can sever in the video, these characters have different given names such as businessman, mother, and fashion lady, which enables you to find the proper role quickly and make a captive marketing video easily. If you are the type of guy or gal who likes to learn-by-topic, you will be happy to use this marketing video software. Animiz's built-in assets like images and actors have been categorized under specific names in the library. This software also categorizes all support articles based on real user feedback. Click on a category name and see all the relevant assets or articles to help create wonderful videos quickly. If you feel more comfortable searching for the built-in assets and article you need, you also will find Animiz pleasing. 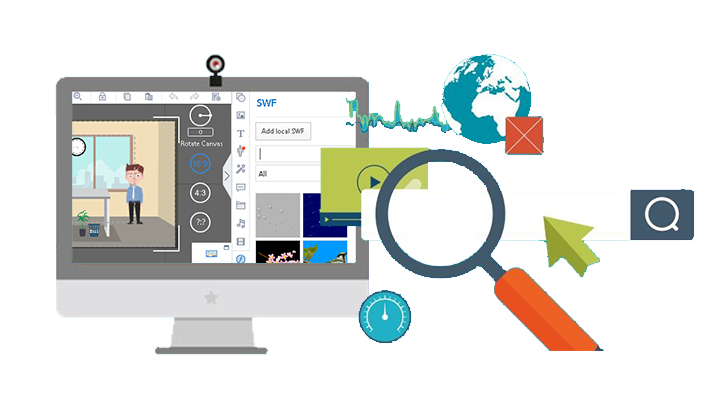 The search function of this marketing video software is powerful. Type in your keywords in the corresponding search bar in the Animiz library or help center, and relevant assets or articles will appear. You can always find what you want easily in this way. 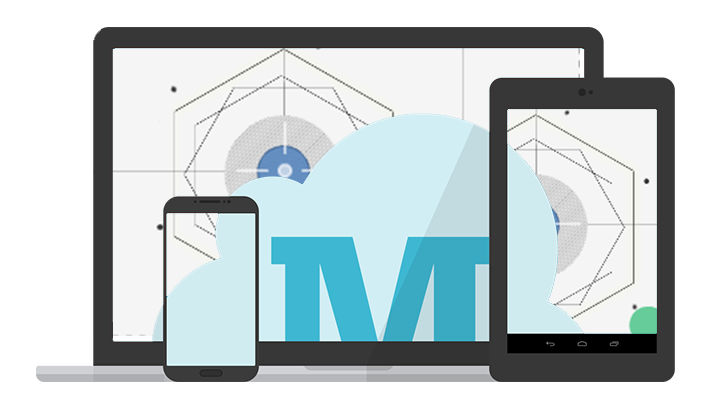 When using this marketing video software to create a video, you are allowed to upload your video directly to the cloud. Thousands of viewers can access your marketing video on the website of Animiz. What's more, after published on the Cloud, your marketing video can be shared on a variety of platforms, via link or QR code automatically created by Animiz. Just click to share your work with people online. Sign in Animiz account and download the desktop animation software. Apply a marketing template and start to make editings to this template. 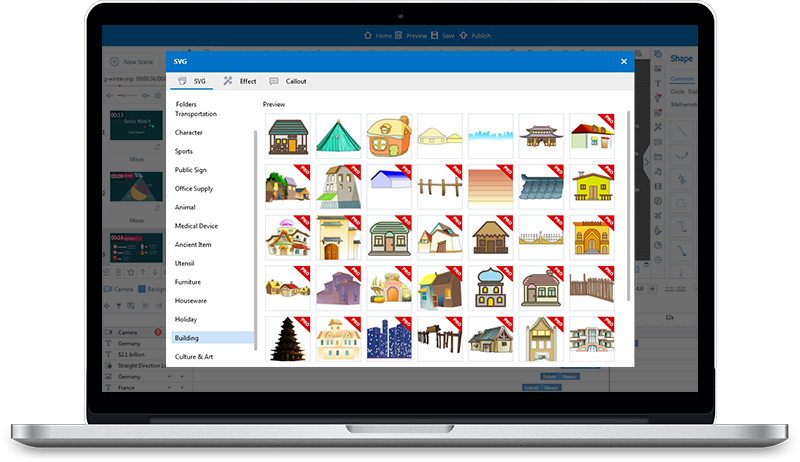 Browse by category or use the search function to find assets in the library. Click or drag and drop to add these assets to enrich your video contents. Publish the video to the cloud with simple clicks, share videos with audience on social channels.